I'm not sure TMZ knows what transgender means. Of course he lost and I'm glad. I don't understand- maybe the clothing was less than formal for the occasion! his hair looked NICE! but the clothing um?? did not really look great but don't you have a wardrobe consult before you even go on air! when you work for a company you are representing them not YOU! I hope he really did not get his feelings hurt but this happens all the time when producers don't like your clothes they change them!!! B. Scott and Oprah Winfrey have something in common -- all their life, they had to fight! -- at least that's what Scott says as part of his lawsuit against BET ... claiming he feels like O's character in "The Color Purple." 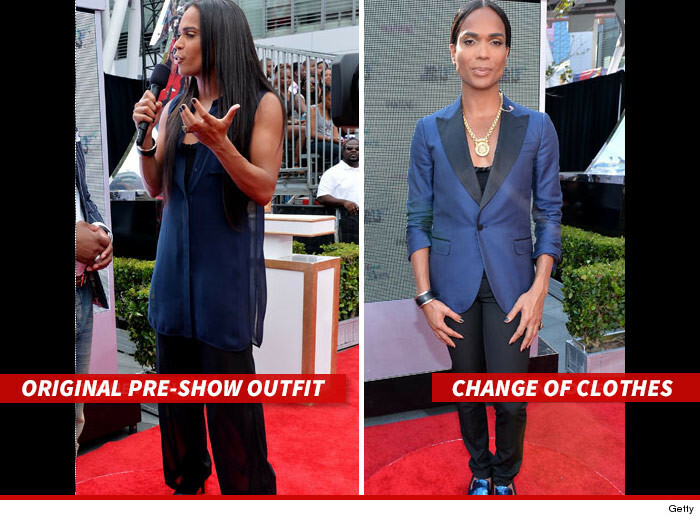 As TMZ first reported, B. Scott -- an openly gay transgender person -- is suing BET, claiming the network humiliated him during last year's BET Awards by yanking him off the show because he was wearing women's clothes. Scott says in the deposition -- obtained by TMZ -- before the blow-up he hadn't thought of himself as a transgender person, but during his battle with BET he came to realize that's exactly who he is. He explains, "I feel like Sofia in 'The Color Purple.' 'All my life I had to fight!' Because of my experience with BET, it led me to the realization that I am transgender because of my gender identity and expression, it was specifically because of my gender and not my sexuality that made me a target." ---- but im sure that declaration was made to narrow the scrutiny on the case...if you're not transgender you can't really claim you were discriminated against for having to wear "gender appropriate" clothing.